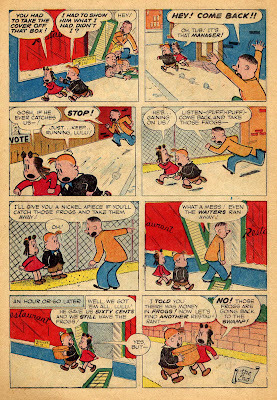 Before John Stanley established his superior versions of Marge Buell's Little Lulu characters, New York-based animators Famous Studios (formerly the Fleischer Brothers' company) brought her to the screen. Their series of Lulu animated shorts ran from 1943 to 1948. They made 26 cartoons. Some are quite good, if you are willing to accept their extremely scaled-down version of Lulu, and can abide a world in which Tubby is called "Fatso." Famous lost the licensing rights to Buell's characters in 1948. In Lulu's place, they created the truly unbearable Little Audrey. Thad Komorowski, youthful animation historian, has aptly described the Audrey cartoons as being "...as funny as AIDS or nuclear war." 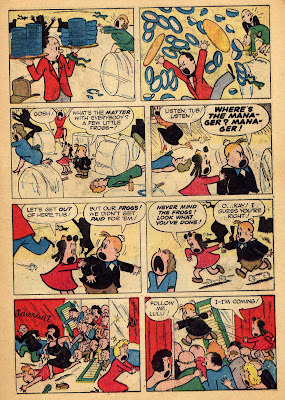 At their best (such as the frenetic 1946 short, Bargain-Counter Attack), the 1940s Famous Studios Little Lulu shorts succeed, in spite of missing the boat on how to make the most of the themes and characters. It remained for John Stanley to flesh out Buell's stick figures, and give them compelling, distinct personalities. The cartoon series' theme song, however, stayed alive, and was pleasantly recorded by modern jazz pianist Bill Evans on his Verve album Trio '64. 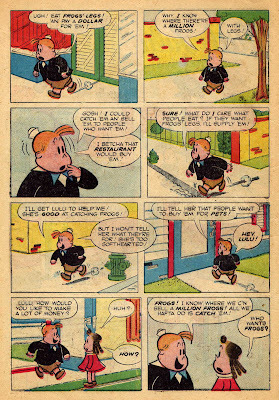 In the late 1950s, Famous Studios sold the rights to all their series characters (which included Casper the Friendly Ghost, Herman and Katnip, Baby Huey, Buzzy the Crow and the dreaded Audrey) to Harvey Comics. By this time, they were renamed Paramount Cartoon Studios. 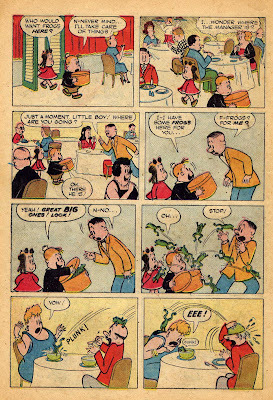 At this time, they also ended a long series of cartoon adaptations of E. C. Segar's Popeye the Sailor. This series began with the Fleischers, in 1933, and lasted 'til 1957. 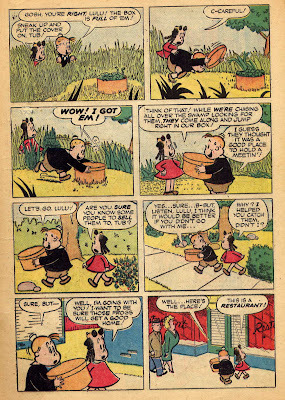 Like Dell Comics, Famous Studios' meat and potatoes had been doing licensed adaptations. It made sense for them to fish around and find another hot property to bring to the screen--be it small or big. Thus, they returned to the past. One of their graspings-at-straw was to revive the Little Lulu cartoon series. Two were made; both are adaptations of John Stanley stories. These appear to have been made for TV consumption. Paramount elected to release the Lulu cartoons theatrically. I have not been able to view the first of the two 1960s "Lulu" cartoons, Alvin's Solo Flight. 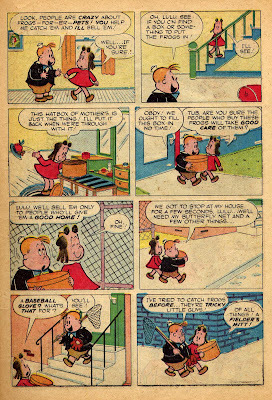 I assume it is based on Stanley's story, of the same name, that appeared in the final one-shot "Four Color" Little Lulu (#165). The cartoon follows Stanley's published story rather slavishly. It would appear that the Paramount/Famous staffers used the comic book as an ersatz storyboard. You'll note that no story credit is given on this cartoon. This would indicate that they did just use a copy of the story in lieu of sketching it out schematically. This might have been part of the cost-saving appeal of doing these adaptations. No story team needed--just transfer the comic book panels to animation! Much is lost in translation. 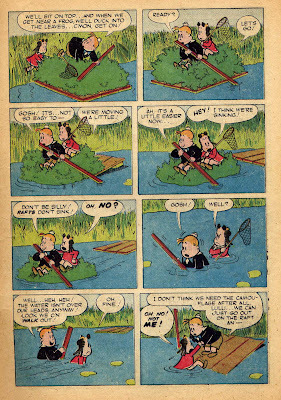 The original story is a charming piece of Stanley sitcomix. It doesn't blow a wild note, or challenge the medium of funnybooks in any big way. It's just a good story, with solid characterizations, an amusing situation, and a riotous comedic denouement. 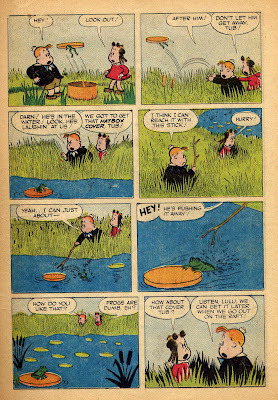 The cartoon deletes the episode of the camouflaged raft, which, with director Seymour Kneitel's maddeningly even pacing, would only slow things down further. Otherwise, the cartoon follows Stanley's story almost verbatim. Eliminated, tellingly, are the more colorful and Tubby-centric bits of dialogue, such as his enraged call for the restaurant's manager, amidst the chaos of panicky diners and agitated frogs. They make one major change to the ending--instead of Lulu responding to Tubby's plan with righteous anger, she is surprised, and then chuckles. Part of the flaws of the animated Frog's Legs lie in the cheapness of the animation. By the ate 1950s, Paramount/Famous had abandoned the flowing full classic animation styles, as had most other studios, for a simpler, more stylized kind of post-UPA movement. If you watched Chew Chew Baby, you saw a more inspired example of Paramount/Famous' stylized limited animation. Broad poses that avoid subtle in-beween animation, strong character design and better choices of extreme poses work wonderfully well in that cartoon. Here, all the life has been beaten out of a reasonably good story, from the flaccid voice-work to the blah pacing. The animation has no spark to it. Not that a frenzy of movement was needed, or would be fitting. Lulu is a bland cipher here. In the 1940s cartoons, she was a bit of a hellion. 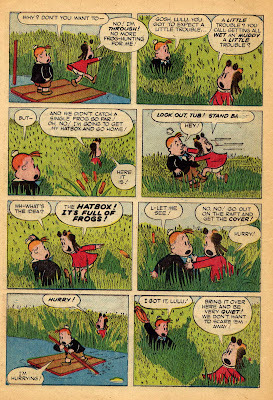 The characters of Tubby and Lulu seem heavily medicated in Frog's Legs. The reader of Stanley's version is compelled to see what they do--and why they do it. In the animated version, the kids don't act or think in any vivid way. It's pretty obvious that Paramount's cartoonists just didn't grok the charm of Stanley's writing or characterization. Chalk up another X on the Lost Opportunities chart! The two Famous cartoons wouldn't be the last time John Stanley's Lulu was animated. Japan's Nippon Animation studio did a 26-episode Lulu series in 1976. These were dubbed into English and briefly shown here in 1978. They're currently quite hard to see. I don't know if any of the Nippon episodes keyed off Stanley's stories. A HBO series of the 1990s, produced by Canada's Cinar animation studio, used several classic Stanley stories as the basis for its episodes. UK comedienne Tracey Ullman supplied Lulu's voice in its run of 52 half-hour shows. Cinar treated the original texts with a bit more reverence than did Paramount, but they tinkered with story details. The series was well-received by the general public. 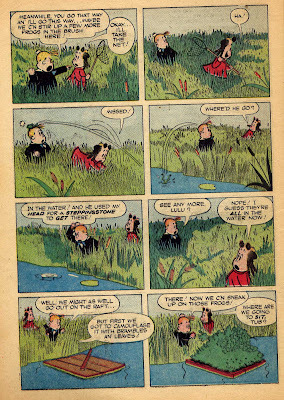 It says much for the quality of Stanley's Little Lulu that its static, page-bound images resound with more life than any of the animated incarnations. 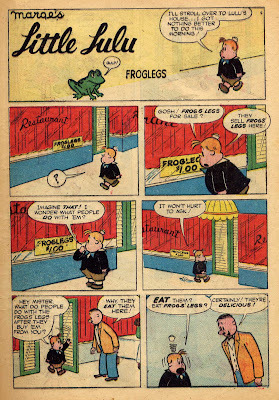 Frog's Legs is a curiosity piece, and a valuable how-not-to lesson in turning comix into animated cartoons. P.S. Thanks to Jerry Beck of Cartoon Brew for offering a superior print of "Frog's Legs" for this post. He's also provided access to the other Famous/Paramount Lulutoon, Alvin's Solo Flight. This cartoon fares better in comparison with the original comic-book story, so check it out, too, if you're digging through the past posts on this here blog. Interesting comparison, and I agree that the comic book version is far superior. Also, thanks for posting this particular story. For some reason, I've always enjoyed the long Lulu and Tubby stories that were typical of the early issues. It doesn't help for a modern audience that Lulu's voice sounds like Cree Summer as Elmyra Duff. In fairness' to Famous, Tubby was only called Fatso in one short (Beau Ties). He regains his official moniker after that. I've often said that the Famous Lulus are my favorite "Golden Age" cartoon series. They're not as objectively as good as the output of WB, Disney, Tex Avery and H-B at MGM or Fleischer, but I just enjoy them. The stiffness of the animation of Frogs Legs robs it of much of the charm it could have had. Still, for this era of animation you could do worse. Wow, I'm honored you dredged up that quote. And goddammit, there's that "historian" label again! I guess I have to acqueise. Interesting someone blogged this cartoon with the original comic. Yeah, you only wish they tried harder. This was during a period when the studio was trying out different things that either worked or didn't, as well as doing the TV Popeyes and later KFS stuff on the side. None of it worked, but they're interesting footnotes to the end of Kneitel's reign in the studio that ended with his death in '64 (to be replaced by several others who came and went). It's a shame they couldn't credit John Stanley for the story anyway, and instead gave Buell and someone else credit as "Co-Producers". 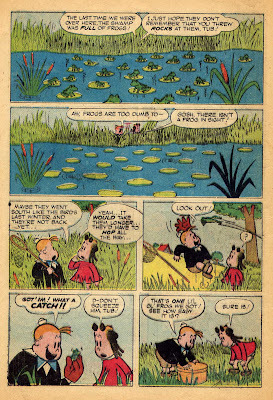 The first of the two Lulu's also had Buell's name used in the copyright of the cartoon rather than Paramount Pictures Corporation you see in the second. They were really kissing up here weren't they? 1962 was the year I think Irv Spector left the studio, so they no longer had that one guy to write/animate the edgy stuff anymore, yet the Modern Madcaps continued in whatever capacity provided. I think the best cartoons he did were "The Plot Sickens" and "Crumley Cogwheel". It's true to argue cartoons like the two stated above worked well since the writing had to overcome the limitations in the animation now that they've adapted to the more UPA approach that became a standard by the end of the 1950's. Oh yeah, I have seen the Japanese "Little Lulu & Her Little Friends" too! I thought they did a rather nice job on the stories despite the rather "potato-headed" look of the characters. In the US, it was dubbed into English by ZIV International who didn't have a lot of success in importing several Japanese cartoons over in the early 80's (others they had included familiar legends like Captain Harlock and Candy Candy). Nope,sorry,gotta respectfully disagree about the 1960's Popeye cartoons. I liked them growing up back then,still do. I like the Beetle Bailey and Snuffy toons too. Krazy Kat was okay. Altho i do prefer the Little Audrey comic books a bit over the cartoons.